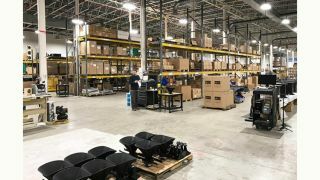 Fulcrum Acoustic has greatly enhanced manufacturing capacity with the completion of a new 35,000-square foot facility in Whitinsville, MA to house its loudspeaker cabinet manufacturing, final assembly, shipping, and warehousing operations. "This expansion has been a massive undertaking but it's very gratifying to see it all come together," said Fulcrum Acoustic co-founder and vice president of R&D, David Gunness. "The new space includes a precision woodshop featuring a state-of-the-art computer numerical control (CNC) router, as well as dedicated areas for secondary operations, cabinet assembly, finishing, and painting. By closely aligning Fulcrum's engineering and manufacturing functions, the new workspace further enhances our ability to bring innovative, technology-driven loudspeaker solutions to market quickly." "We take pride in manufacturing high-quality, high-performing products in the U.S.," said Fulcrum president Stephen Siegel. "Manufacturing and supporting our products from our Massachusetts facility helps to ensure timely order fulfillment and technical support. It also gives us the flexibility to custom-build products readily to meet customer-specific needs."